Analysts and Zanu PF bigwigs who spoke to the Daily News agreed that “dark clouds” were hanging over Zimbabwe after the government ratcheted up its crackdown on the former freedom fighters, including effecting more arrests of the beleaguered leadership of the Zimbabwe National Liberation War Veterans Association (ZNLWVA). In a desperate bid to shore up his waning national support, Mugabe’s close aides arranged a hastily put together meeting between the increasingly frail nonagenarian and a faction of the war veterans in Harare on Wednesday, where the long-ruling leader issued chilling warnings to his growing band of critics — including the church, western embassies, journalists and ex-combatants. “History has shown us that Mugabe’s threats are seldom empty. Mugabe has basically declared open season on dissenting voices within and without Zanu PF and he will prevail if people cower and rush to hide. “However, the challenge for Mugabe is that where in the past his hand has been stronger because of relative unity in Zanu PF, this time around the enemy is both internal and external. “Some of the war vets who have backed him have even declared that they have had enough of his leadership, at the same time that citizens’ movements like #Tajamuka and #ThisFlag have animated people and emboldened them,” analyst McDonald Lewanika said. Lewanika added that he firmly believed that if people remained steadfast in their quest to have Mugabe resign, the nonagenarian threats against pro-democracy activist would come to nought. “Mugabe can threaten everyone but can only win if these different groups fail to appreciate that they are stronger together, and continue to allow their various differences to separate them. And if they band together and continue to resist, Mugabe’s threats can be made empty,” Lewanika told the Daily News. The 92-year-old leader was publicly humiliated by war veterans last week when they served divorce papers on him, including through a stinging communiqué which forced Zanu PF to convene Wednesday’s meeting in Harare where Mugabe warned that they would be punished severely. “During the war we had sell-outs on various stages. We would punish them and build underground cells, and we used to give them sadza while they were there,” the nonagenarian said. Former Zanu PF spokesperson Rugare Gumbo, who was once thrown into dungeons by Mugabe while in exile in Mozambique in 1978, said yesterday that the Zimbabwean leader did not tolerate dissent. “He will not tolerate any opposition and will have anyone who challenges his rule arrested. He is talking about a third force, blaming the West and the church for instigating people to rebel but the reality is that the third force is the people who are suffering, yet he has no compassion but to clampdown on dissenting voices,” Gumbo said. True to Mugabe’s word, his panicking government arrested war veterans spokesperson Douglas Mahiya on Wednesday, sending hundreds of former freedom fighters into hiding in fear of also being nabbed. 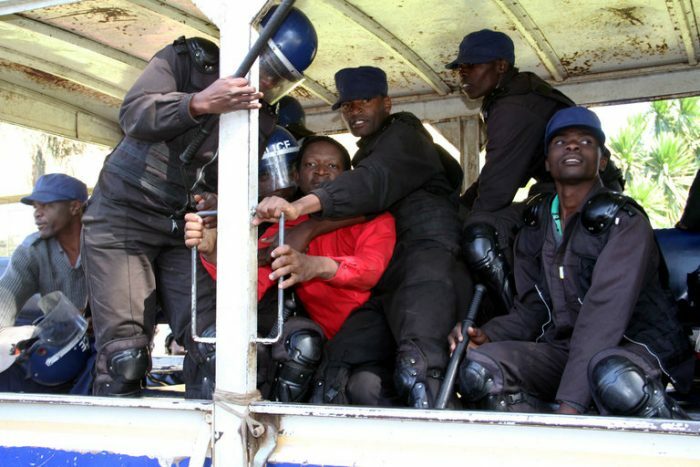 And yesterday, forthright war veterans’ secretary-general, Victor Matemadanda, was also arrested in Gokwe, as the crackdown on the restless ex-combatants gathered pace. “Mugabe is pretty lethal and extremely vicious when his hold on power is threatened. Of course, as the MDC, we are concerned and worried by his threats to clamp down on opposition political parties. “We can only ignore these ominous and tyrannical threats at our peril. He has no respect for the rule of law. Not too long ago war veterans were also tear-gassed after they had protested. And if violence can be unleashed on war veterans what about us and the church?” MDC spokesperson Obert Gutu asked. Former war commander Bernard Manyadza (war name Parker Chipoyera), who like Gumbo was also arrested at the instigation of Mugabe towards the end of the liberation struggle in the late 1970s, said the Zanu PF leader could not be left to do as he pleased anymore. “We are tired of his threats because Mugabe, who was himself once arrested championing democracy, has now become the number one enemy of democracy, threatening war veterans who raised legitimate questions about governance. “What he is doing clearly shows that this organisation has become counter-revolutionary. Our comrades in Zanu PF were asking legitimate questions and they are told you have no right, and yet during the war we were politicised soldiers,” Manyadza said. Another political analyst, Dewa Mavhinga, warned that Mugabe’s threats and attacks against his critics would only serve to worsen the current dire situation in the country. “Things are falling apart. His elaborate patronage system is crumbling because the country is broke and there are no solutions in sight,” Mavhinga said.